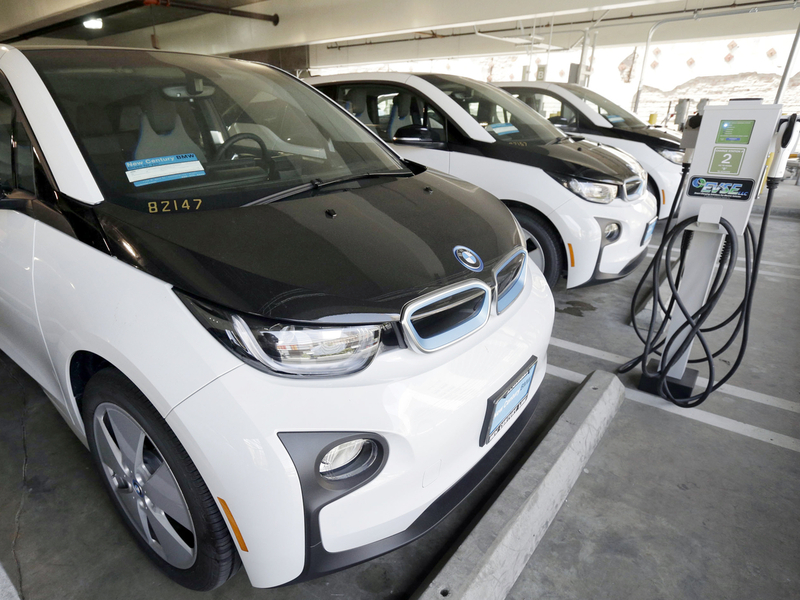 Administration Gives Electric Car Charging Grid A Boost : The Two-Way The White House announced it is establishing 48 corridors on America's highways for charging electric vehicles. 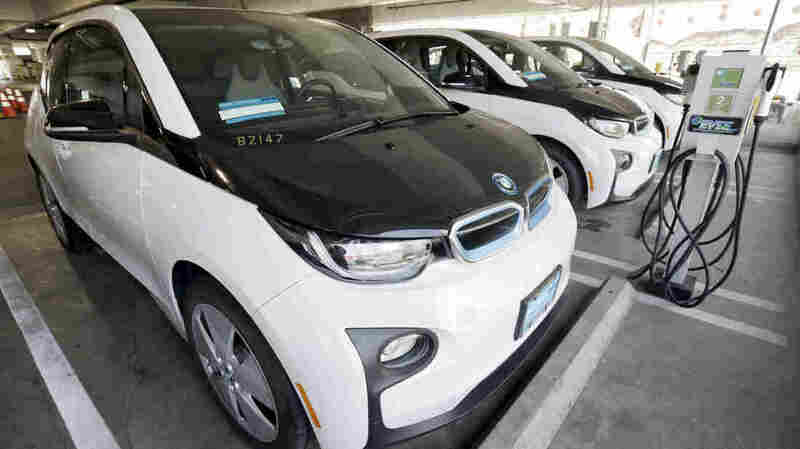 The Los Angeles Police Department's fleet of BMW i3 electric cars. Several companies, cities and states announced plans to establish national grid for EVs. When electric cars began to take hold in the U.S. market — a small hold — the big concern was range anxiety: the fear that your vehicle doesn't have the fuel to get to your destination. It's easy to forget how vast and complex the existing infrastructure for gas vehicles is. Not having that convenience is a problem the sellers and proponents of electric vehicles been working to change. Now, the Obama administration says it will significantly expand the nation's infrastructure for electric vehicles. The U.S. Department of Transportation is establishing 48 national electric vehicle charging corridors. Those vehicle routes dotted with charging stations are intended to cover 25,000 miles of highway in 35 states. "For the first time, the United State Department of Transportation (DOT) is establishing 48 national electric vehicle charging corridors on our highways, these newly designated electric vehicle routes cover nearly 25,000 miles, in 35 states. "38 new businesses, non-profits, universities, and utilities are signing on to DOE's Workplace Charging Challenge and committing to provide EV charging access for their workforce." The administration is sprinting to do everything it can think of to accelerate the move to clean energy, according to Roland Hwang, director of the energy and transportation program at the Natural Resources Defense Council. "This is a better mousetrap when it comes to the environment. This is the future of clean transportation technology. We need this to get off of fossil fuel," Hwang says of the White House announcement. The idea is to add thousands of electric charging stations around the country. In addition, states and local governments signed up to increase electric vehicles in their fleets. The administration points to the example of California pledging to buy 150 zero-emissions vehicles (electric or fuel cell). It will also provide charging at a minimum of 5 percent of the state-owned parking places by 2020. This all comes as consumers are turning away from sedans and moving toward SUVs and pickups. David Shepardson of Reuters looks at the problem of slow electric adoption by consumers. "In August 2008, Obama set a goal of getting 1 million plug-in electric vehicles on the roads by 2015. Only about 520,000 electric cars have been sold in the United States since 2008, out of about 250 million cars and trucks on U.S. roads. "The White House has repeatedly tried to boost EV sales, including hiking the EV tax credit and converting it to a point-of-sale rebate, but the proposals have yet to pass Congress. "Electric vehicle infrastructure will also get a boost from Volkswagen AG's diesel emissions settlement. The German automaker must spend $2 billion over 10 years to improve infrastructure and other efforts to advance zero emission vehicles." Hwang says while electric cars have failed to take hold in the U.S., that's not the case in Europe or China. He points out that the biggest seller of electric passenger vehicles is not Tesla but the Chinese company BYD. Hwang says now that all those places moving in the same direction, "it almost forces the auto industry to make significant investments in the technology, just to keep up." He says a byproduct of the emissions scandal at Volkswagen is that company is now investing significantly in electric vehicles. "Their biggest pathway to the future is now electric," Hwang says, because the biggest market for electric cars is China. He says right now, China is what the industry has to follow.